What’s up with the new bridge in Point Mugu State Park? 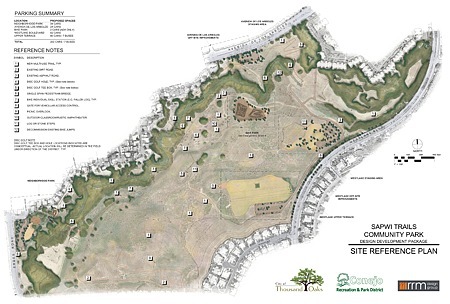 Conejo Rec and Parks District (CRPD) of Thousand Oaks listened to the public’s desires for non-mainstream recreational facilities, including the Bike Park, Frisbee Golf, Model Aircraft Launch, and hiking and biking trails. This is also balanced by habitat preservation and restoration, with only about 18 acres of the 145 acre park being developed. Things are moving forward with the park’s master design almost ready to be put out to bid. 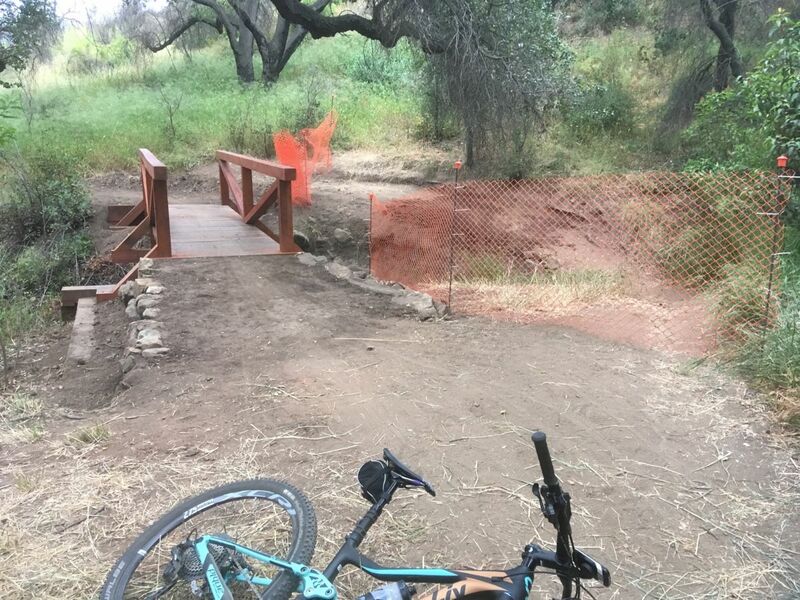 CORBA and the CRPD have entered into an agreement to help bring a bike skills park to Sapwi Trails Community Park in Thousand Oaks. The agreement allows us to raise funds, hire design and construction contractors, put volunteers to work, and work side-by-side with the CRPD to make this happen. There haven't been any CORBA trailwork days since the last eTerraTimes was posted at the beginning of May. Volunteers are finishing the first part on the new trail on Earth Day. 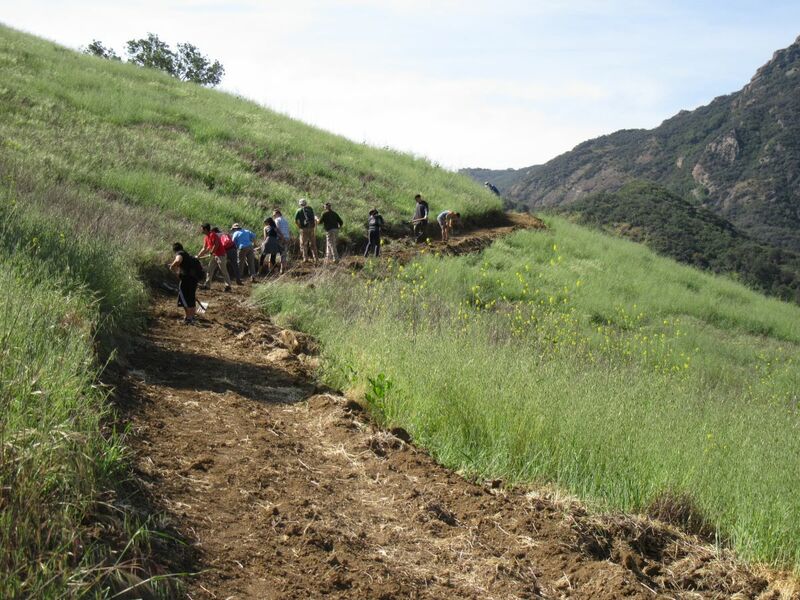 In 2010, a steep and unsustainable spur of the Grasslands Trail in Malibu Creek State Park was closed for plant rehabilitation. The spur was a shortcut from Grasslands to High Road. Fences were erected at both ends and “Closed” signs were posted. The plan from the beginning was to rebuild the trail along a much less steep and much more sustainable route. After years of distractions by fires and floods in other parks, it is finally open! The new trail starts near the top of the old spur and connects to High Road a little further west (closer to the MASH site) than the spur. 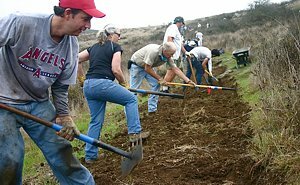 It was built in two parts; first by volunteers on Earth Day in April, then finished by State Park workers. Recently a sturdy bridge was built across a short gully on the Sin Nombre Trail in Point Mugu State Park. This bridge bypasses a sharp corner that has been the location of many serious mountain biking accidents. Here’s the story of the corner and the bridge. The new bridge on the Sin Nombre Trail in Point Mugu State Park. The corner in question is about 0.1 miles from the top of the trail at Ranch Center Road, where a small, usually dry stream crosses it. The corner looks really easy to negotiate and that’s the deception that has caused so many injuries. The natural tendency is to brake to slow on the downhill side to negotiate the sharp corner. The climb out of the corner is unexpectedly steep, so riders who haven’t downshifted can stall and put their foot down. They always put their left foot down because they’re already leaning that way after going around the sharp left corner. Unfortunately the trail is very narrow on the climb out, so unless the bike is on the very inside edge of the trail, the foot goes off the edge of the trail, followed by rider and bike, ending in a pile on the rocks of the stream bed. The seriousness of the injury is dependent on how lucky the rider is on landing on the rocks several feet below. Some of the injuries have been very serious, resulting in broken bones and nerve damage. CORBA with lots of help from the Santa Monica Mountains Trails Council worked to improve this section of the trail in 2012. Volunteers widened the hazardous section of the trail a few inches. Unfortunately the trail can’t be widened further because of oak trees and their roots on the inside edge of the trail. This spring an Eagle Scout candidate embarked on a project with State Park officials to fix this issue once and for all. The result is the new bridge, with the old hazardous section closed off. Probably some people will be upset that the thrill of rounding this one corner has been removed from the trail, but I hope that when they understand why, they will be happy to give up one turn to save less-experienced mountain bikers from falling on the rocks and seriously injuring themselves. As far as I know, nobody has been killed on this corner, but it was just a matter of time. On June 23, 2017, Congresswoman Judy Chu introduced a bill to expand wilderness areas in the Angeles National Forest, and protect several rivers as wild and scenic. Spearheaded by the San Gabriel Mountains Forever group, the bill is the result of many years of efforts to protect our local mountains. A previous success of this group was the establishment of the San Gabriel Mountains National Monument. CORBA President Steve Messer has been representing mountain bikers on the San Gabriel Mountains Community Collaborative, working alongside representatives of the Sierra Club, The Wilderness Society, and other environmental and social justice organizations. For the past eighteen months we’ve been working to ensure that mountain biking gets due consideration in these proposals. 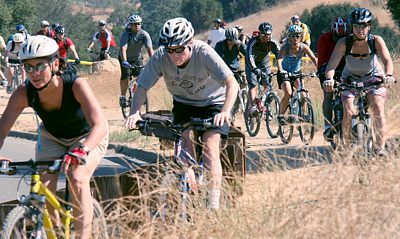 CORBA has opposed previous wilderness efforts that hurt bicyclists’ access to trails. With support from IMBA and MWBA, we worked out boundary adjustments that expand the Sheep Mountain and San Gabriel wilderness areas, but do not impact any trails that are currently open to bicycles. The bill also establishes two new units of the Wilderness Preservation System, the Condor Peak Wilderness and the Yerba Buena Wilderness. These two wilderness areas protect the majestic Condor Peak, while leaving the Condor Peak trail (see photo) outside the wilderness areas with a wide buffer. 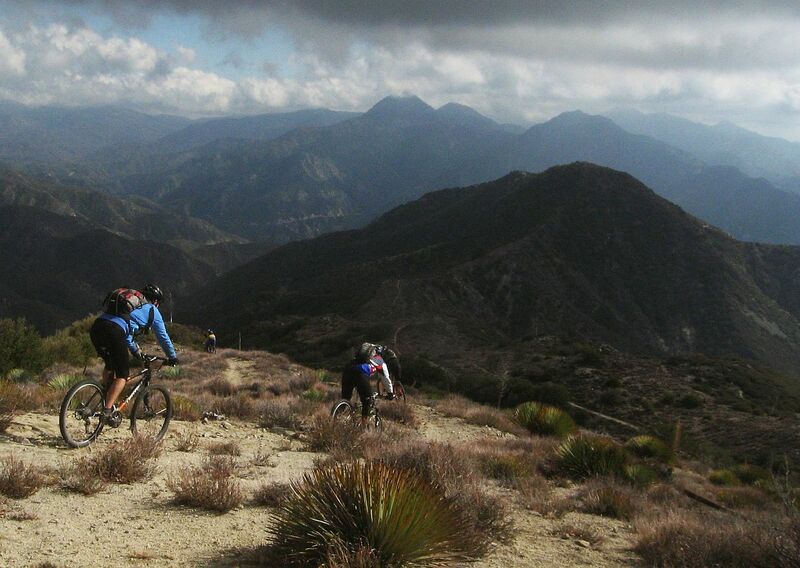 While Condor Peak is not a popular trail for cyclists, it offers an increasingly-unique wilderness-type backcountry experience for those seeking to challenge themselves in nature. 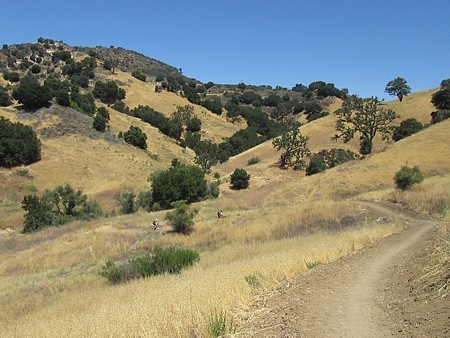 The western boundary of the proposed Yerba Buena Wilderness is the Yerba Buena Ridge trail, which could provide an epic backcountry loop ride with Condor Peak trail. Both trails, however, are in need of maintenance and are on our radar for future restoration work. Saturday July 1st is the next skills clinic.